Brad Smelley (born April 20, 1989) is an American football tight end who is currently a free agent. He was drafted by the Cleveland Browns. He played college football at the University of Alabama. He has also played for the Houston Texans. Smelley was drafted by the Cleveland Browns in the 7th Round, 247 overall in the 2012 NFL Draft. 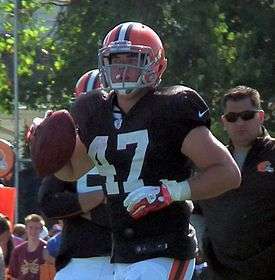 Brad was let go from the Cleveland Browns on August 31, 2012 and signed to the practice squad. On December 10, 2012, Smelley was signed to the Cleveland Browns active roster. On September 1, 2013, Smelley was cut by the Cleveland Browns and became a free agent. Smelley was signed to the St. Louis Rams practice squad in November, but was released three days later in favor of Justice Cunningham. On December 3, 2013, Smelley signed with the practice squad of the Houston Texans. The Texans promoted him to the active roster on December 13 but was later released. Smelley was signed by the St. Louis Rams on August 11, 2014 to fill the void left by Mason Brodine after he was placed on injured reserve. He was released during final cuts on August 29, 2014. He was signed to the Rams practice squad on September 3, 2014. On January 6, 2016, Smelley signed a futures contract with the Rams. ↑ "Brad Smelley Stats - Cleveland Browns - ESPN". Espn.go.com. 1989-04-20. Retrieved 2012-08-17. ↑ Zangaro, Dave (December 3, 2013). "Texans add Smelley to practice squad". CSNHouston.com. Retrieved 2014-07-10. ↑ Wilkening, Mike (December 13, 2013). "Texans promote tight end Brad Smelley from practice squad". NBCSports.com. Retrieved 2014-07-10. ↑ Inabinett, Mark. "Brad Smelley gets spot on St. Louis Rams practice squad". Retrieved September 23, 2014. ↑ Simmons, Myles (January 6, 2015). "Palardy, Smelley Signed to Futures Contract". StLouisRams.com. Retrieved January 8, 2016.